Steps Ahead offers a wide variety of class options and encourages dancers of all levels to reach their maximum potential. All classes have a strong technical base, but are eclectic in their style of movement and expression. (1 Hour Class) - Our Tiny Tots program is designed to provide our younger students with a basic foundation of dance skills by incorporating creative movement and dance technique. Your child will develop fundamental motor skills including rhythm, coordination, balance and flexibility. Our program will teach your child to follow directions, learn how to share and take turns, while improving their memorization and attention span. All Tiny Tots classes include tap, jazz and ballet and will be a memorable experience for both you and your child. (1 Hour Class) - Our Tinies 2/Tinies 3 program combines tap, jazz and ballet to provide your child a well-rounded beginning in dance. Your child will learn basic ballet technique, including barre, center floor, and basic ballet positions. Tap will develop rhythm and musicality while learning basic tap technique. Jazz dance is also introduced, which will focus on strength, technique, memorization and terminology. 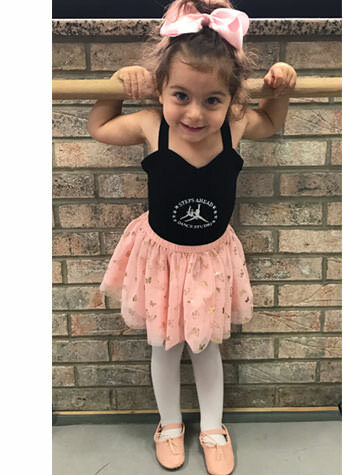 Our Tinies 2/Tinies 3 program will also prepare your child for a more advanced dance training in our programs and will be a momentous time to remember forever! (1 Hour Class) - This class is structured to stimulate coordination skills, listening skills, balance, music interpretation, creative movement and motor development in the youngest dancers, ages 12-24 months. This program is an excellent introduction to the world of dance and lots of fun for Mom and toddler! (1½ Hour Class) - Our Combo program is truly a “step above the rest”. This class will include a half hour of ballet, a half hour of tap and a half hour of jazz. Your child will learn ballet terminology and technique including barre, center floor and progressions (across the floor). The tap curriculum will teach your child to count music, develop rhythm, memorize terminology and learn proper execution of beginner tap techniques. The jazz curriculum includes a center floor warm-up including isolations and exercise that build strength and develop technique, progressions and turns. This program is to prepare your child for our full hour classes and will instill your child with confidence and fundamental values to last a lifetime!! Our tap program is offered to all ages and levels. It includes barre, center floor, progressions, turns, rhythms and dance combinations. Several tap styles are taught, including the “Broadway style” using accurate feet and arm placement, and the hottest trend “Hoffin” using intricate rhythms and speed. Terminology is taught at all levels, while continually increasing technical skills. Our jazz curriculum incorporates ballet technique to develop a strong foundation. Jazz classes include barre, a unique center floor warm-up including isolations and exercises that build strength and develop technique, progressions and a focus on jumps and turns. Dance combinations can consist of classical, musical theatre or 'cutting edge' choreography. Lyrical incorporates strong ballet and jazz techniques to become a favorite dance form among our students. Students are recommended to take a ballet class when enrolling in our lyrical program. Your child will focus on technique, musicality and performance ability while learning to dance using different emotions and expressions. Each class consists of center floor and barre warm-up, extensions, jumps and turns, progressions and invigorating emotional dance combinations. Our Hip-Hop program combines the latest video, club, street and funk styles to create the hottest dance class available! Each 1-hour class begins with stretch and warm-ups including isolations and strength exercises. All moves and music are age appropriate and level specific. Hip-Hop is specifically geared towards self-empowerment and positive self talk, using dance to teach personal power and respect. Developing coordination and rhythm, your child will learn dance combinations with the most innovative choreography in Queens! Ballet is the foundation for many other dance forms, such as jazz, tap, hip-hop, etc. Ballet teaches alignment, placement, balance and elegance. Our professional ballet program incorporates different methods to provide your child with a well-rounded education of ballet techniques. The ballet class consists of barre, center floor, adagio, allegro and progressions, while developing grace and poise. Terminology and proper technical execution are the primary focus of your child's dance training. If you are a student of dance and looking for a great class, try ballet - and give yourself a chance to experience art in its purest form. Modern is a form of dance that relies on movement that is more natural and organic for the body. In this class, students will explore the techniques of Martha Graham and Lester Horton. Dancers will experiment with movement principals such as fall and recovery, contraction and release and lateral movement. The students will begin to push the limits of their techniques by discovering new ways of using music and sound to intensify the emotion in their movement. Our acrobatic classes focus on increasing the flexibility, strengthening/conditioning and developing the tumbling skills of our students. From bridges to aerials, acro skills of all levels will be taught. (Drama/Vocal/Dance) - This is a program based in musical theatre that includes technique training and fun learning games to strengthen a child's confidence and artistic talents. There will be a scene presentation at the end of each session. This class allows students to explore their creativity through movement and emotional expression. This class will also provide opportunities for students to focus on collaboration, improvisation and exploration of partnerwork.